How Do You Handle Your Negative, Complaining Child? I have a twelve-year-old child who tends to be negative. Of course, all kids have moments of whining, complaining, and displaying “the glass-is-half-empty” attitude now and again, but this particular child seems to have a knack for dwelling on the worst outcome of any given situation. Maybe some of you can relate. 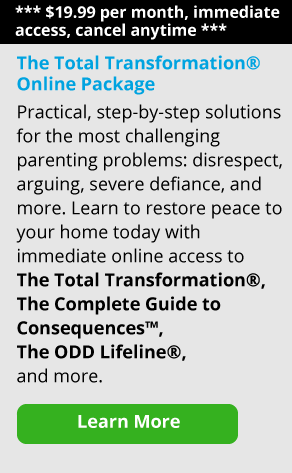 If you have a child who tends to be negative, you know how emotionally exhausting it can be. There are days when I feel like my ears are going to bleed and fall off from all the negative energy this one child can produce! The interesting thing is that this negativity seems to be just one of a whole host of emotions that swirl around in the body of this passionate child of mine. While he is also amusing, interesting, stubborn, and unique, his negativity, at times, stands out the most because of the toll it can take on me and the rest of the family. Sometimes I ask myself why his negative behavior bothers me so much and why I can’t just ignore it. (You’re probably asking the same thing.) Well, there are a few reasons. First, I have a tendency to be negative myself sometimes when things don’t go just my way, so I am viewing myself first hand in my little complainer. Let’s face it, that’s never a pretty picture! Second, having a negative child tends to conjure up in my mind images of negative people I find it hard to be around. When my child drones on and on about the unfairness of the world, my energy is instantly zapped. Lastly, a negative child begets negativity in those of us around him. My other kids answer him back in nasty tones, my husband gets terse with everyone, and I spiral into a mood of gloom and doom where I imagine my child at age 80 sitting in a local pub droning on about the miseries of the world to anyone who will listen. Negative thinking, I have learned, can indeed be contagious. So what to do about this loving, yet negative child? Well first, I’ve had to have a frank talk about what kind of behavior I expect from my son when he gets this way. One helpful idea that worked for us was explaining the difference between being positive and being negative. After defining what those two terms meant, the two of us came up with how we act (and yes, I included my bad-mommy negative moments too) when we choose to be positive and when we choose to be negative. Some examples my son came up with were, “When I’m positive I’m light, fun to be around, and cute. When I’m negative, I am all dark, I’m mean, I complain, and I whine a lot”. And not so cute. So, when the negativity starts, I am able to say, “You know, you’re sounding like that negative boy we talked about. I can’t talk with you until you can change your tone”. Now bear in mind, I’m not sending the message to my kids that they have to be filled with sunshine all the time, but there are constructive ways to voice ones complaints without bringing the rest of us down to rock bottom. I am also working very hard to create a mantra in my head that allows me to ignore the negative remarks. One thing that signals to my son that I am done listening to him spiral out of control with complaints is when I say, “You need to do your best with this.” That’s it. No discussion, no trying to cajole him out of his bad mood. From that moment on, he is on his own to resolve his inner angst. If he chooses to calm down, then we are able to have a great conversation about his unhappiness. If not, he is welcome to sit in the another room until his dark mood changes. Lastly, my husband once told me that he notices that my son’s mood changes drastically when he is either hungry or tired. I guess I never noticed this because, as my husband pointed out, I get crabby and snippy when I’m hungry and tired. Ah, the beauty of seeing yourself in your kids! This becomes a sign to both my son and me that bed time needs to get moved up or a snack is in order (not just for my son, but me as well). I’ll be honest, I wonder about this dark, negative side I see in my child every day. I try not to get too concerned about what it will mean (the down side of being a psychologist!) and understand that my child’s temperament and personality are filled with a range of emotions that include this negative behavior that I don’t like. In the end, I guess it’s about teaching him how to balance negativity with being positive, and learning the skills he needs to navigate in the world. I’m curious about how other parents handle this type of behavior in your house and what works for you. Do you have a child who complains a lot and who has a negative attitude about things? How have you been handling it? 1. Ask Parent Coaching: My Whining Kids are Driving Me Crazy! 2. Ask Parent Coaching: What to Do When Your Child Says "I Don't Care"